These are both 16-bit general purpose timers with four modes of operation. With these modes we can allow the timers to operate as general purpose 8-bit auto-reloading timers, 13-bit and 16-bit timers. Most commonly the 16-bit timer mode (Mode 1) is used as it is the simplest mode available. Additionally, we can take outputs of these timers. Unlike typical 8051s, we can use chose from Fsys, fixed and prescaled Fsys (Fsys / 12) or external input as timer clock sources. Timer 2 is different from Timers 0 and 1 in many aspects. Mainly it is used for waveform captures. It can also be used in compare mode to generate timed events or compare-match-based PWM. It has auto-reloading feature unlike Timers 0 and 1. Timer 3 is an auto-reloading 16-bit timer with no output and Fsys as clock source. Like Timer 1, Timer 3 can be used for serial communication hardware (UART). The self-wake-up timer or simply wake-up timer is a special event timer that is not available in standard 8051s. The purpose of this timer is to wake-up or restore the normal working of a N76E003 chip from low power modes after a certain period of time. 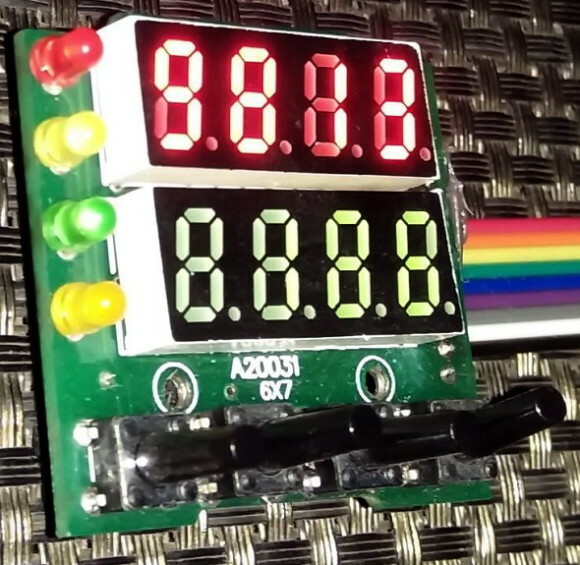 It can also be used to trigger timed events or trigger other hardware. The watchdog timer of N76E003 can be used either as a 6-bit general purpose timer or as a standard watchdog timer. Most commonly it is not used as a general-purpose timer because that is not what it is meant to be. In watchdog mode, it helps in recovering a stuck N76E003 micro by resetting it. 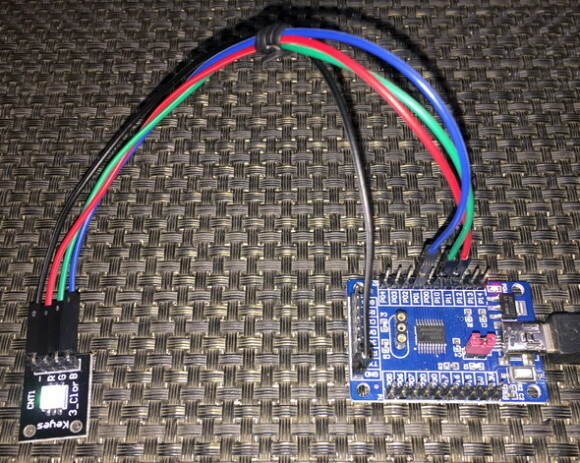 While using BSPs be careful about timer-based delay routines and UART routines. These built-in routines reset and reconfigure timers according to their purposes. Make sure that there is no conflicting issue when using them. To avoid such conflict, either use software delay routines or one dedicate timer for a particular job. For instance, use Timer 1 for delays and Timer 3 for UART. You have to know what you are doing and with which hardware. Time-base generation is one of the most basic function of a timer. By using time-bases, we can avoid software delays and unwanted loops when we need to wait or check something after a fixed amount of time. BSP-based delay functions are based on this principle. 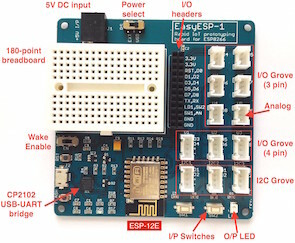 Here in this section, we will see how to create a time-base to toggle P15 LED. For demoing time-base generation, we don’t need any additional hardware since we will just be blinking P15 LED without software-based delays. Before I start explaining the code example, I would like to discuss how Timer 0 and 1 works in Mode 1. In Mode 1, these timers behave like up-counting 16-bit timers. This means they can count (contents of TL and TH registers) from 0 to 65535 with every pulse/clock tick. There is no down-counting feature in these timers. The source of these pulse/clock ticks can be from system clock, prescaled system clock or from external inputs. When external inputs are used, these timers can be used like counters. Unlike conventional 8051, there are options to take output from timers. The outputs change state with overflows/rollovers, i.e. when the timer counts resets from 65535 to 0.
provided that the initial count of the timer was set to 0. This is what we are doing in the set up. After setting the timer’s count and the mode of operation, the timer is started. Functions set_Timer_0 and get_Timer_0 writes Timer 0’s count and reads Timer 0’s count respectively. It is needed to toggle the state of the P15 LED and yeah, that is done at every half count of the timer, i.e. at every 327ms. In the main, the timer’s count is checked using get_Timer_0 function. When the timer’s count is less than 32767 counts, P15 LED is held high. P15 LED is set low when the timer’s count is greater than this 32767. In this way the toggling effect is achieved without software delays. However, the timer’s count is frequently polled. We have already seen the operation of general-purpose timers in Mode 1. In this segment, we will how to use these timers in Mode 0. Everything is same between Mode 0 and 1. However, the timer counts or resolutions vary in these modes. Mode 0 makes general purpose timers behave as 13-bit timer/counters. 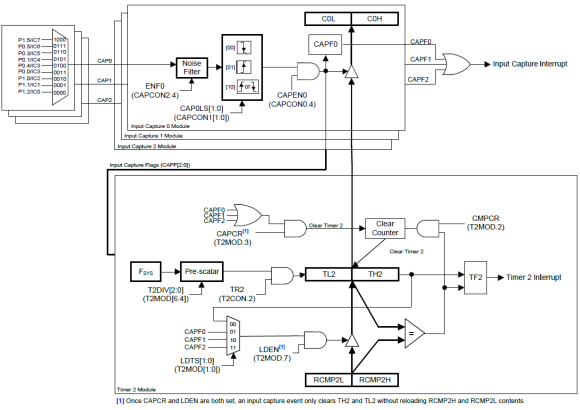 Check the block diagram shown above and compare with the one previously shown. Note the greyed-out part in this diagram. The upper bits of TL registers are not used in this mode. Between Mode 0 and 1, personally Mode 1 is easier than Mode 0. Here Timer 1 in Mode 0 is used to create a digital stopwatch. The timer is, therefore, set at this count value. Now how do we set the timer in Mode 1? Check the register diagram below. The grey part is what is ignored. Remember that TL and TH are 16-bits as a whole but out of that we will just be using 13-bits. Unlike the previous example, here interrupt is used to keep time. The timer run bit, global interrupt and Timer 1 interrupt are all enabled when the start button is pressed and are all disabled when the stop button is pressed or the stopwatch is reset by pressing both buttons. At every timer overflow interrupt the timer’s counter is reset to 0x1D64 to make sure that there are 667 counts before the overflow. The time data is displayed on an LCD screen. Timer 2, as I stated before, is different in many areas from the other timers of N76E003. In my opinion, it is best suited for measuring pulse widths, their periods and thereby frequencies. In other words, it is the best wave capturing tool that we have in N76E003s. Unlike conventional 8051s, there varieties of option to capture wave or generate compare-match events. In this segment, we will see how to make a frequency counter with Timer 2’s capture facility. We will also see how to generate Timer 1’s output. and low for the same amount of time. 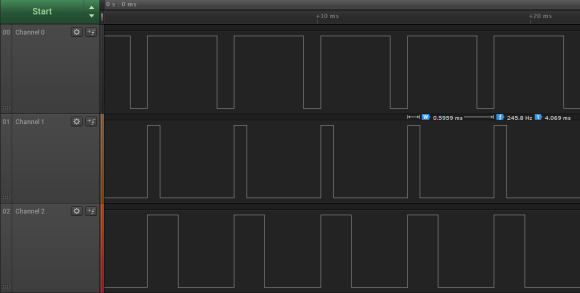 So, the total time period of Timer 1’s output is roughly 16ms. Therefore, the frequency of this output is about 60Hz. P00 is the Timer 1’s output pin and P12 is the capture pin of Timer 2. 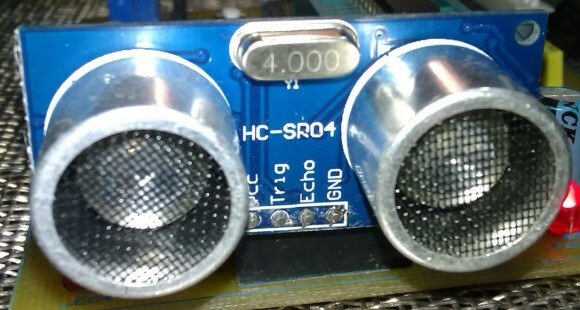 When P00 and P12 are shorted together, the frequency counter made here with Timer 2 and its capture unit will read 60Hz. So how it is done by Timer 2 and the capture unit? Next, Timer 2 is started with its interrupt enabled. 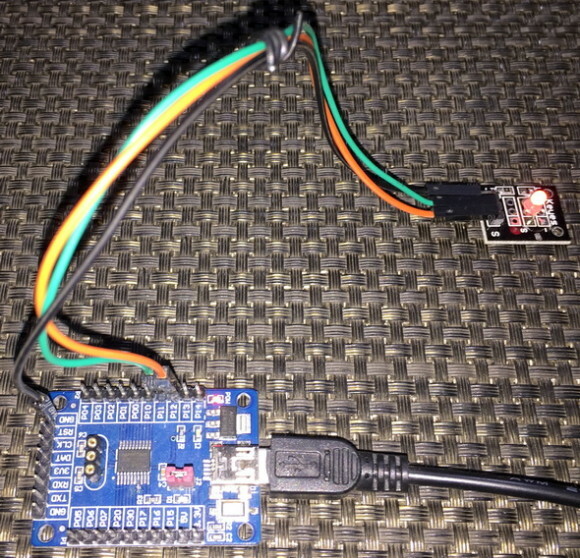 Finally, the capture pin and its channel to be used are enabled using BSP-based definition. Capture interrupt is also enabled. 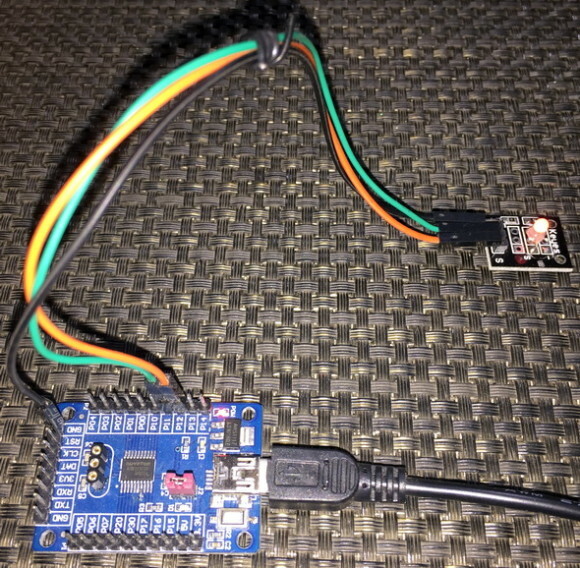 “input capture pin 0 connected to P12 GPIO pin is connected to capture channel 0 to detect falling edge transitions”. Since there is one interrupt vector for all three capture channels, we have check first which capture channel caused the interrupt and clear that particular interrupt flag soon. Capture interrupt, in this case, occurs when a falling edge is detected by CAP0 channel. When such an interrupt occurs, the time of its happening, i.e. the counter value of Timer 2 at that instance is stored. This marks the first falling edge event. To measure period or frequency of a waveform, another such falling edge is needed. Therefore, when another falling edge is detected by the capture hardware, the process repeats. This results in the time capture of two events. We know the frequency of the timer’s clock and so we can find the value of its each tick. We have two captures in form of two Timer 2 counts. We can find the difference between them and thereby compute the time period (pulse_time). Since the time period of the captured waveform is calculated, its frequency can be deduced. This is done in the main loop. In the last segment, it was demonstrated how to capture a waveform and compute its frequency using Timer 2’s capture hardware. This segment is basically an extension of the last segment. Here, it will be shown how we can use two capture channels connected to the same capture pin to find out the pulse width of a pulse. 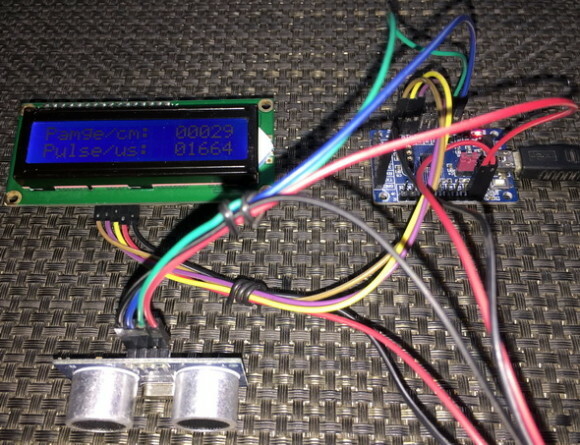 For demoing this idea, a HC-SR04 ultrasonic SONAR sensor is used. The SONAR sensor gives a pulse output that varies in width according to the distance between the sensor and a target. HC-SR04 SONAR sensor has two pins apart from power supply pins. These pins are labelled “Echo” and “Trigger”. When the trigger pin of a HC-SR04 is set high for about 10μs, it acknowledges this short duration pulse in the trigger pin as a command from its host micro to measure and return distance data. P11 is setup as the trigger pin and P12 is set up as the echo pin. The concepts of input capture are same as in the last capture example but there are a few minor changes. Firstly, the system clock speed is set to full 16MHz using HIRC. Secondly, the setup of Timer 2 is slightly changed. Auto-reloading is enabled this time. Timer 2’s clock is prescaled to 1MHz. This is done so in order to make sure that the capture has a resolution of 1μs and the timer doesn’t overflow while taking measurements. The maximum possible width of a pulse from HC-SR04 is 38ms when no obstacle is detected by it but with this timer setup we can measure pulse widths up to 65ms. Timer 2 is also set up as to reset its count when a CAP0 event occurs. 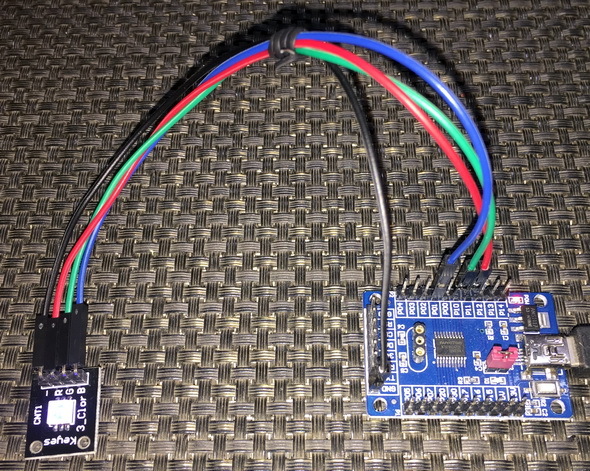 In order to measure pulse widths, we can use one capture channel in both edge capture mode or use two capture channels connected to the same input capture GPIO pin detecting different edges. The latter is used here. I didn’t use BSP-based definitions for setting up captures in this example because of some limitation. BSP-based definitions reset selections. This is why I configured the input capture control registers manually. 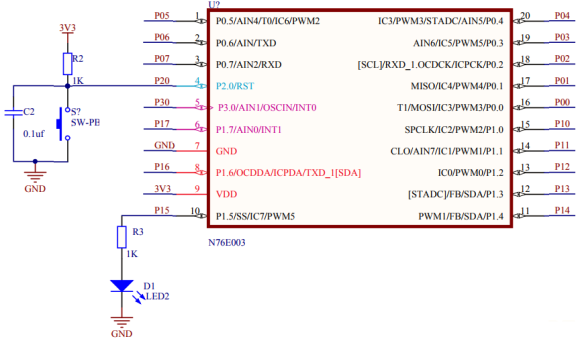 Two capture channels having different edge detections are used and both of these channels share P12 or IC0 pin. Now when HC-SR04 is triggered, it will give out a pulse. We have to measure the width of that pulse. A pulse is defined by a rising edge and a falling edge. CAP0 channel is set to detect the rising edge of the pulse and reset Timer 2 to 0 count. CAP1 channel is used to detect the falling edge of the same pulse and read Timer 2’s count. This count represents pulse width in microseconds. In the main loop, distance is calculated using this measured pulse width time and the formula given in HC-SR04’s datasheet. The distance found between an object and HC-SR04 is displayed on a text LCD. We all know that N76E003 is a cool chip but it lacks GPIOs unlike other chips of similar capabilities. Thus, we must be miser while using GPIOs. 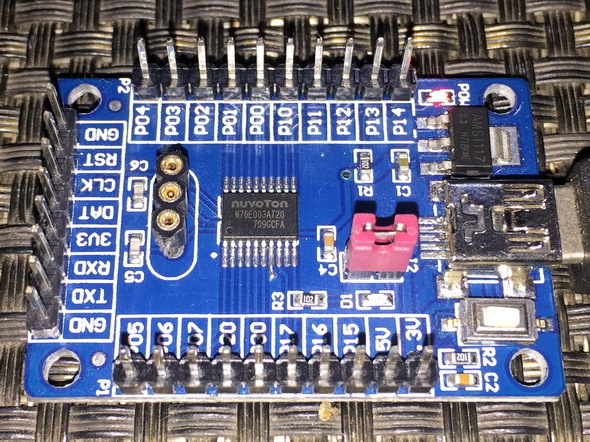 When it is needed to interface several inputs and outputs with a microcontroller using fewer pins, we often take the assistance of logic ICs like shift registers, counters, multiplexers, etc. We have already used this technique while making the 3-wire LCD interface. An LCD has its own controller(s) to take care of projecting data on the screen once data has been feed to it. However, that’s not the case with seven segment displays and keypads when used without any specialized driver IC like TM1640/MAX7219. It is, then, a job for a host micro to do the scanning and data manipulation periodically with affecting other tasks. This can be achieved easily with a timer. In this segment, we will see how the aforementioned is done with Timer 3. For the demo, I used a salvaged temperature controller’s I/O unit. The I/O unit consists of two 4-digit seven segment displays, four LEDs and four push buttons. It is made with a 74HC164 Serial-In-Parallel-Out (SPIO) shift register and a 74HC145 BCD-to-Decimal decoder. In order to use it in real-time, its displays, LEDs and buttons should be scanned and updated at a fast rate without hindering any part of an application running in main loop. Timer 3’s internal hardware is very simple. 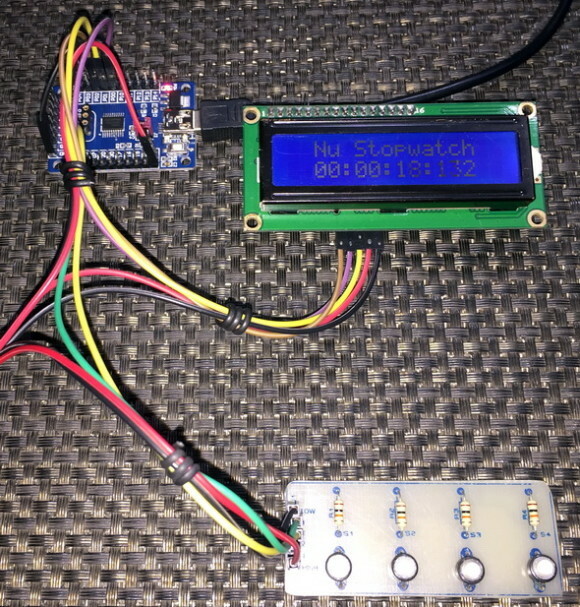 It is an up-counting timer and is run by using system clock as clock source. There is a prescalar to reduce the system clock input. The main feature of Timer 3 is it auto-reload feature. This feature basically allows us to forget reloading its 16-bit counter unlike Timer 0 and 1. There no external input or output option for this timer. Owing to all these, it is most suitable for time-base generation and serial communication. 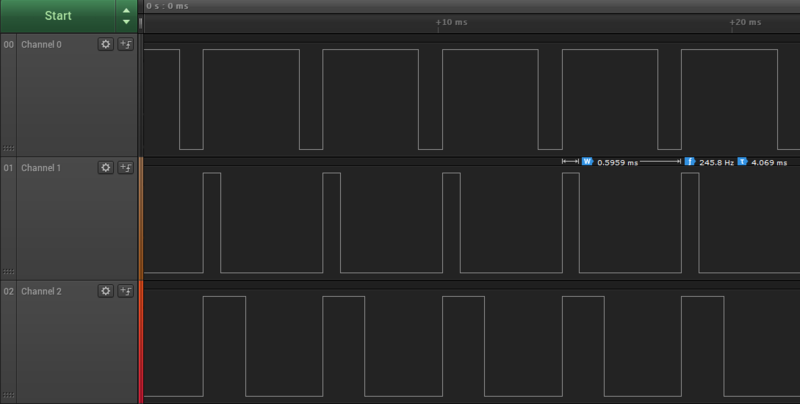 In this demo, Timer 3 is set to interrupt every 100μs. 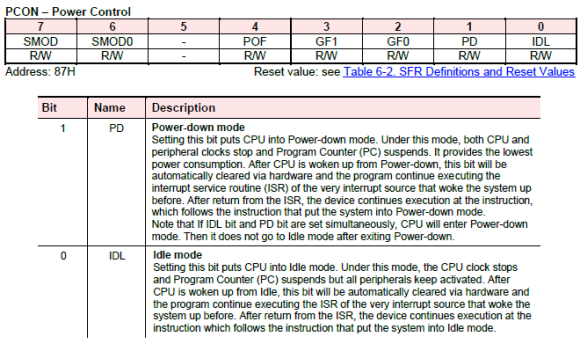 Note that Timer 3’s input clock and system clock frequency is 16MHz since no prescalar is used. Now what we are doing inside the timer interrupt? According to the schematic and objective of this project, we need to update the seven segment displays and read the 4-bit keypad so fast that it looks as if everything is being done without any delay and in real time. Inside timer ISR, both logic ICs are updated. Firstly, the number to be displayed is sent to the 74HC164 IC and then the seven-segment display to show the number is updated by writing the 74HC145 IC. At every interrupt, one seven segment display is updated. 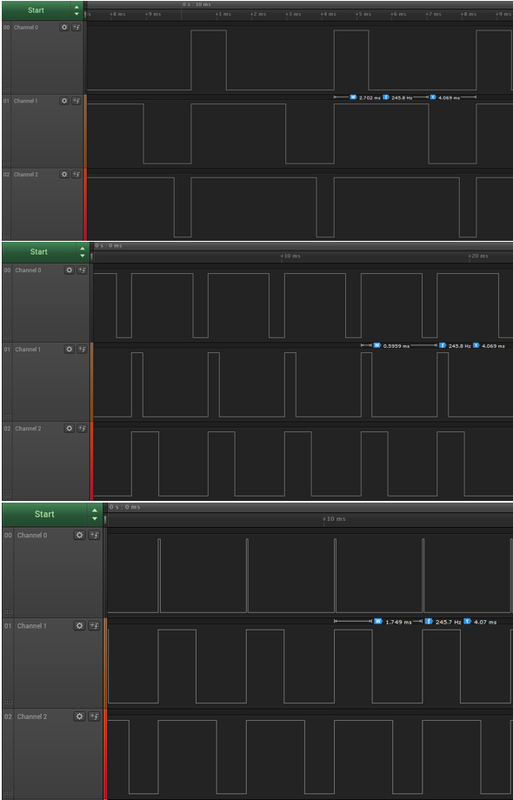 There are 8 such displays and so it takes less than a millisecond to update all these displays. Everything seems to complete in the blink of an eye. During this time the keypad is also scanned in the main. With different keys, different LEDs light up. 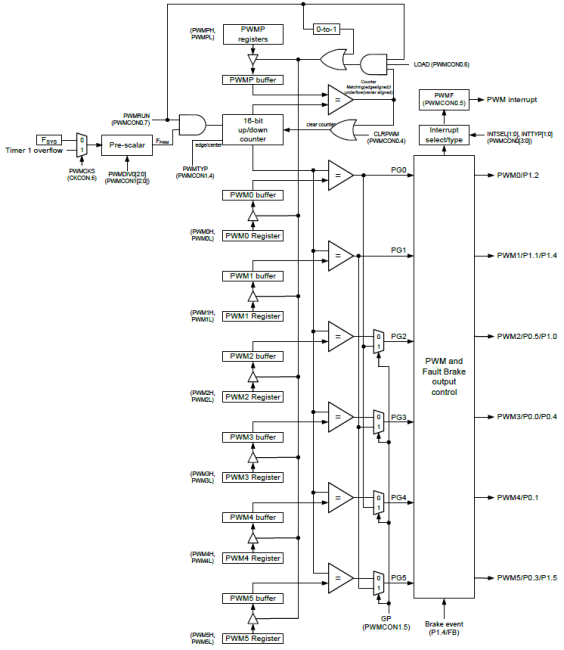 PWM hardware is another basic requirement for any modern-era microcontroller. We can use PWM for a number of applications like motor control, light control, switch-mode power supplies (SMPSs), etc. With PWM we can also simulate digital-to-analogue converter (DAC). Fortunately, N76E003 comes with a separate PWM block that is not a part of any internal timer. It has all the feature that you can imagine. It can be used to generate simple independent 6 single channel PWMs. It can also be used to generate complementary and interdependent PWMs with dead time feature. 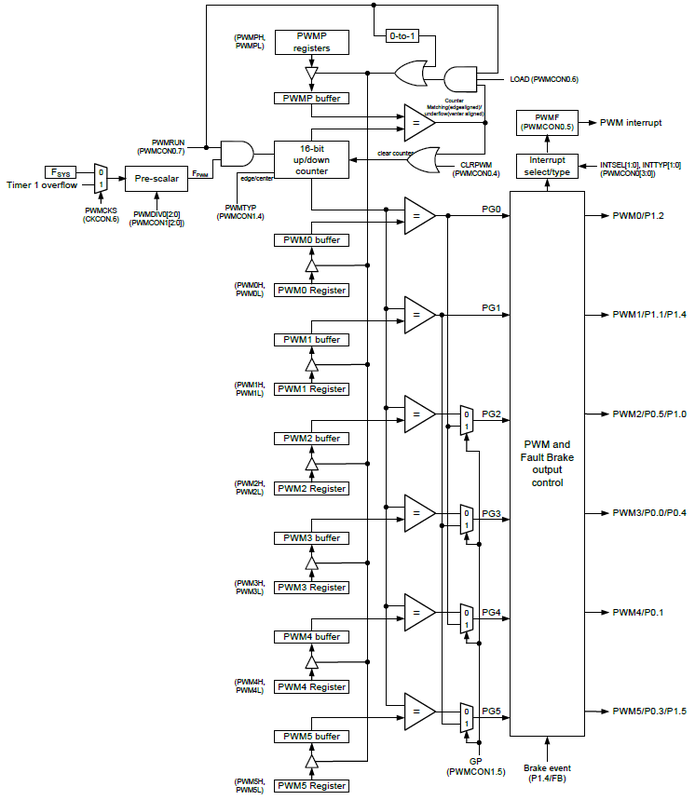 PWM generated by the N76E003’s PWM hardware is based on compare-match principle and this is evident from its block diagram. There are 6 PWM channels and they can be used independently or as interdependent groups to form complimentary PWMs. PWMs generated by N76E003 can be edge-aligned or centre-aligned PWMs as per user’s requirement. The PWM block can be clocked directly by the system clock or by Timer 1 overflow. Additionally, there is a prescalar unit to reduce input clock source. 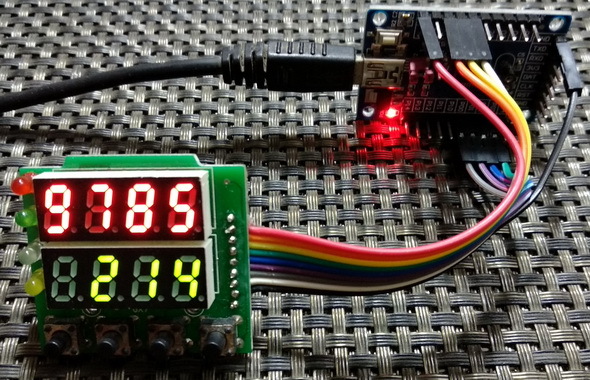 For demonstrating N76E003’s PWM feature, I used an RGB LED. Three independent PWMs were generated using PWM channels 1,2 and 4. Let us look into the process of setting up the PWM channels and the PWM hardware. 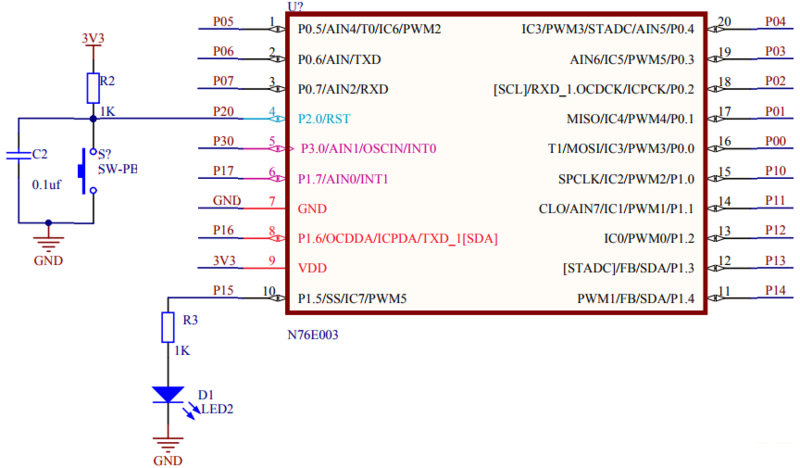 We must firstly set the PWM GPIOs as push-pull GPIOs since PWM is an output function of GPIO pins. We must also enable the PWM output channels we want to use. Secondly, the PWM hardware is set up according to our needs. 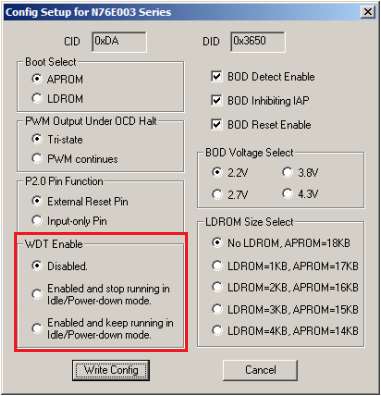 Since we need independent PWMs here, independent PWM mode is selected. Edge-align PWM is selected since it is most easy to understand and use. 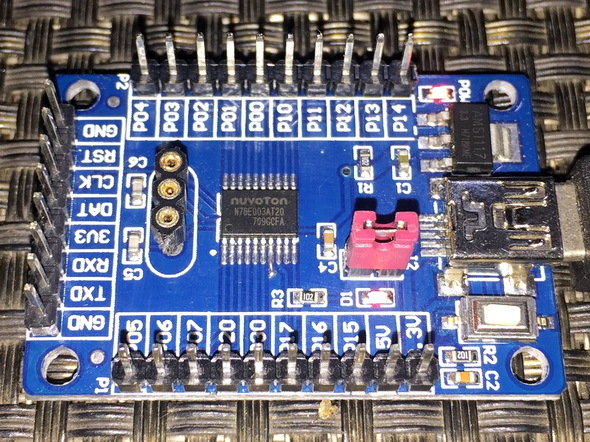 The PWM channels are reset before using them. The PWM outputs are non-inverted and so they are characterized as normal PWMs. Here, I use system clock as the clock source for the PWM block but it is prescaled/divided by 64 to get an effective PWM clock of 250kHz. The PWM resolution is set to 10-bits when we set the period count or maximum PWM value/duty cycle. 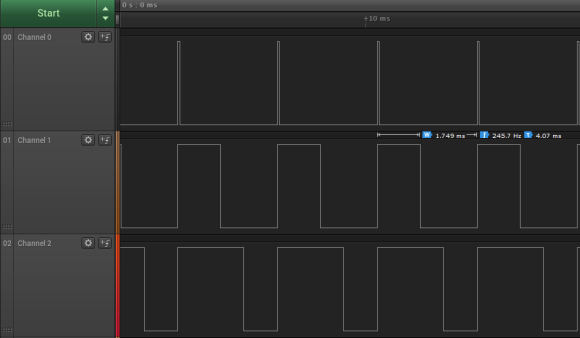 Setting the period count yields in setting up the internal PWM counter. This gives a PWM of approximately 245Hz frequency or 4ms period. Finally, the PWM hardware is enabled after setting up all these. To change PWM duty cycle, functions like the one shown below is called. After altering the duty cycle or compare value, the new value is loaded and run. In the demo, the RGB LED fades different colours as a symbol of changing PWMs. In the last section, we saw how we can generate independent PWM. Now we will see complimentary or group PWM with dead-time. We will also see the things that were skipped in the previous segment. 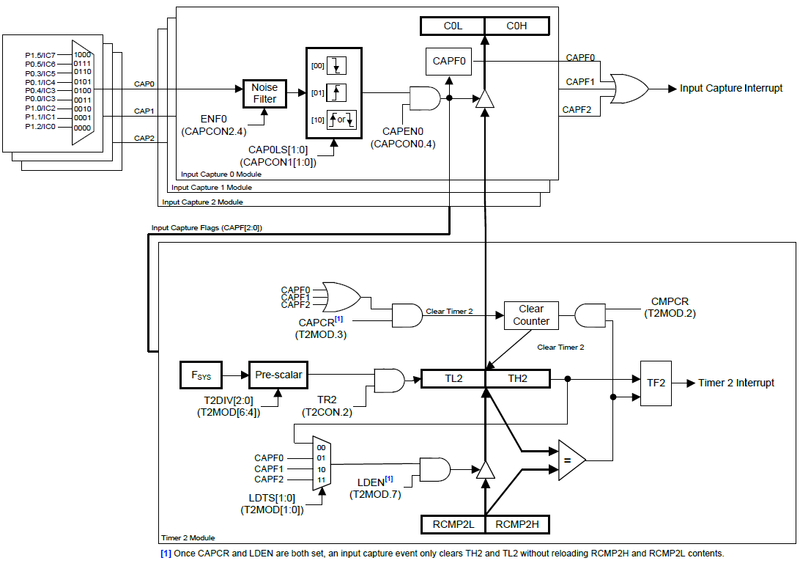 Complementary PWM with dead-time feature is a must-have feature of any PWM drives in today’s embedded-system industry. Unlike the simple PWM we saw previously, this kind of PWM has most usage. Complementary PWM with dead-time is used in applications where we need to design motor controllers, SMPSs, inverters, etc with H-bridges or half-bridges. In such applications, PWMs need to operate in groups while ensuring that both PWMs don’t turn on at the same time. One PWM in a group should be the opposite/antiphase of the other in terms of duty-cycle or waveshape. The first type was demonstrated in the simple PWM example. The second is demonstrated here. From the perspective of a general user, the difference in them don’t affect much. Make sure that you check the formulae for each type before using. The set up for complimentary PWM with dead time is no different from the simple PWM set up. As mentioned, there are a few minor differences. First the mode is set for complimentary PWM mode. Secondly, centre-aligned PWM is used here. 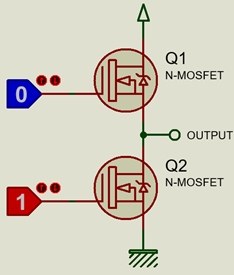 The outputs are also set as inverted outputs, i.e. 100% duty cycle means minimum PWM value/count. The dead time period is set and implemented. Now what is dead time in complimentary PWMs? Well simply is a short duration delay that is inserted between the polarity shifts of two PWMs in a group. 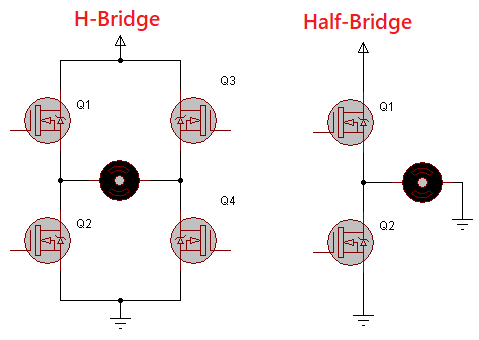 Consider a half-bridge MOSFET configuration as shown above. Perhaps it is the best way to describe the concept of dead-time. Surely, nobody would ever want to turn on both MOSFETs simultaneously in any condition and also during transition. Doing so would lead to a temporary short circuit between voltage source and ground, and would also lead to unnecessary heating of the MOSFETs and even permanent damage. By applying dead-time this can be avoided. In half/H-bridges, complimentary PWMs ensure that when one MOSFET is on, the other is off. 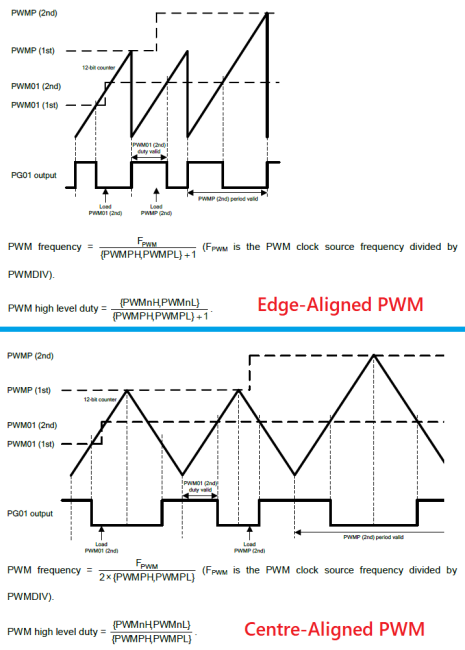 However, at the edges of PWM polarity shifts, i.e. when one is rising while the other is falling, there is short but certain such short-circuit duration. If a dead time is inserted between the transitions, it will ensure that one MOSFET is only turned on when the other has been turned off fully. Since complimentary PWMs work in groups, changing the duty cycle of one PWM channel will affect the other and so we don’t need to change the duty cycles of both PWMs individually. This is why only one PWM channel is manipulated in the code. One of key feature of many modern era microcontrollers is a way to wake up a micro once it went to low power, sleep or idle mode. Like STM8s, N76E003 has this feature. The wakeup timer (WKT) is not a complex hardware. As the block diagram below shows it is just a timer-counter with LIRC as clock source. When the counter overflows, an interrupt is triggered. This interrupt wakes up the N76E003 chip. Wakeup timer is particularly very useful when used with low power modes. In many applications, we need to measure data on a fixed time basis while at other times when measurements are not taken, idle times are passed. These idle periods consume power and so if we use a wakeup timer with low power sleep mode, we can save energy. This is a big requirement for portable battery-operated devices. Examples of such portable devices include data-loggers, energy meters and smart watches. In the demo demonstrated here, P15 LED is toggle fast for nine times. This marks the start of the demo. After this toggling has been done, both the wakeup timer and the power down modes are turned on. During Power Down time, all operations inside the micro are suspended. There is also another low power mode called Idle Mode. Both are similar but in idle mode peripherals are kept active. After the first set of LED toggles and power down mode, it takes about 1.5 seconds (according to the prescalar value of 64 and 256 counts) for the wakeup timer to get triggered. 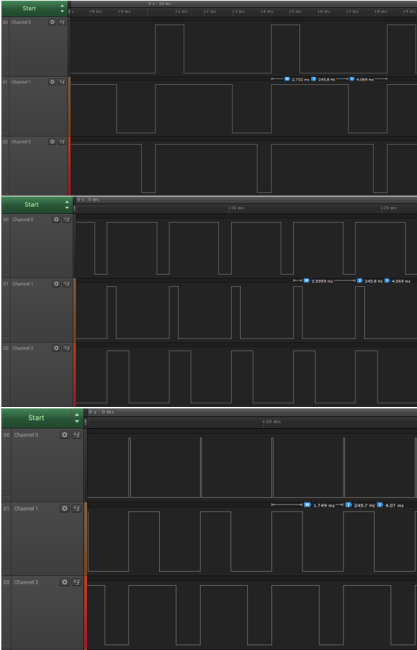 When the interrupt kicks in, the MCU is brought back to working mode and the wakeup timer is disabled. Again, the P15 LED is toggled. This time the LED is toggled at a slower rate, indicating the continuation of the rest of the tasks after power down. After this the process is repeated with power down and wake up timer reenabled. Since interrupt is used, WKT interrupt will be triggered when its counter rolls over. When WKT interrupt is triggered, its interrupt flag should be cleared in the software. The watchdog timer (WDT) of N76E003 is just a reset-issuing timer and the purpose of this timer is to recover a N76E003 micro from an unanticipated event/loop that may result in unresponsive or erratic behaviour. It is clocked with LIRC oscillator and this makes it independent from main clock (HIRC or ECLK) failure. LIRC is prescaled and feed to a counter. When the counter overflows, WDT interrupt is issued, furthermore a reset is also generated based on delay. In normal running condition, the counter must be periodically reset to 0 count to avoid reset. If for some reason this is not done then a reset will be triggered. The watchdog timer of N76E003 can also be used as a 6-bit general-purpose timer. However, this usually not used as such. The only difference between using it as timer and as a watchdog timer is the reset part. For demoing WDT, again the P15 LED is used. The code starts with it toggling states ten times. This marks the beginning of the code and the interval prior to WDT configuration. Next the WDT is setup. Note that the WDT is Timed-Access (TA) protected. TA protection protects crucial hardware like brownout detection circuit and WDT hardware from erratic writes. Without TA protection access, any changes to made to the registers of the TA protected hardware is unaffected. After enabling access to WDT, we can set it up. Setting the WDT requires us mainly to setup LIRC clock prescalar. Once the prescalar is set we are good to go for enabling the WDT. Before all these can be done, we have to enable the WDT hardware either through In-Application Programming (IAP) or by configuration bits during programming.